January 31st marked the 57th World Leprosy Day as observed by the International Federation of Anti-Leprosy Associations (ILEP). Statistics have tallied more than 250,000 cases of leprosy in 2010 in 118 countries. ILEP's Enhanced Global Strategy has a new global target for leprosy to reduce the rate of new cases with grade two disabilities per 100,000 population by at least 35 % by the end of 2015. 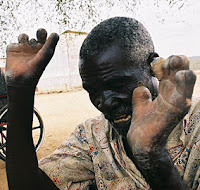 Leprosy remains a major public health concern to Angolan authorities as the country is among the countries which continue recording over a thousand cases, despite having reached the elimination goal recommended by the World Health Organisation (less than 1 case / 10.000 citizens). Angola recorded 1,048 leprosy cases at the 2010 year end. Leprosy (also known as Hansen’s Disease) is a chronic, infectious disease involving the skin and nerves of infected individuals. Pale patches on the skin are usually the first sign of the disease – they are painless and do not itch, so are often ignored by the patient. In the past, nerve damage and other complications occurred as the disease progressed. The numbness and lack of feeling in the limbs often led to festering wounds on the hands and feet, and then to the characteristic deformities of the face and limbs. In many communities this led to stigma towards those affected and their families, causing them to be shunned and even excluded from everyday life. Fortunately, antibiotics can now quickly kill the bacteria (germs) that cause leprosy, so the disease can be completely cured with a few months of treatment. If this is started at an early stage, most patients need never suffer the terrible complications which used to be common. During the fifteenth to eighteenth centuries when leprosy spread through Africa downwards from the East, Christian missionaries opened Angola’s first leprosy colonies towards the end of Portuguese colonial rule. For example Dondi leprosarium in Huambo province was started in 1940 and in 1946 a leprosarium was established in Jamba in Benguela province. The Serviço de Combate à Lepra (Leprosy Combat Service) was started in 1958 by the Government of Angola, comprised of leprosaria and leprosy settlements where people affected by leprosy were living. Some of these were being cared for by the Evangelical and Catholic Missions, but their technical supervision passed to the government program. In the same year the Angolan Government opened its first Government leprosarium in Cazombo in the province of Moxico. 15,280 cases of leprosy were recorded in 1973 in a total of 20 leprosy villages. Dapsone monotherapy was the only treatment. The Portuguese left Angola in 1974 and the civil war soon broke out, the resulting conflict caused wide scale destruction of the health network, the deterioration of socio-economic structures and huge movements of the population which undermined capacities to detect and treat diseases such as leprosy. Churches continued to play a vital role in the provision of leprosy services during the civil war – ILEP Members AIFO and ALM were providing leprosy care through their health institutions and programmes in ten church-related projects. Up until 1975 people affected by leprosy were seen in fixed Health Units and visited by Mobile Brigades. Migration to larger cities such as Huila, Luanda and Benguela from 1997 meant that they became the focus for leprosy control activities and contained 40% of known leprosy cases in the country. In April 2002 a peace agreement was signed ending the civil war. In that year India, Brazil, Nepal, Mozambique, Madagascar and Angola accounted for 90% of leprosy cases around the globe. Rebuilding and reconstruction began.